Written and first recorded by James “Wee Willie” Wayne (1951). Also recorded by Professor Longhair (1951), Louis Jordan (1952), Holy Modal Rounders (1964). Popular versions by Richard Hayes (US #15 1952), Dr. John (1972), The Clash (1980). From The Originals: “It’s almost a miracle we actually know this is a James Wayne song, for he was locked away in a madhouse for arson. All the while his royalties went in someone else’s pockets, not to mention the shrewd and obscure labelboss Bob Shad, who signed for as many of Wayne’s compositions he could lay hands on. Here’s poor James in his mental institution claiming authorship to anyone he bumps in to. Written by Sonny Curtis and first recorded by The Crickets (1959). First covered by Paul Stefan & the Royal Lancers (1962), Bobby Fuller (1964). Hit versions by The Bobby Fuller Four (US #9/UK #33/CAN #11 1965), The Clash (recorded 1979 |UK #29 1988). 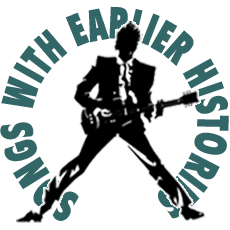 “Bobby Fuller, in 1964, had a regional hit with his first cover of ‘I Fought the Law’, released on Exeter Records in New Mexico and West Texas – his biggest local hit. In 1965, Fuller re-recorded by song (using the same group of musicians) for Del-Fi Records label and, with national promotional support, reached #9 on the Billboard Hot 100.